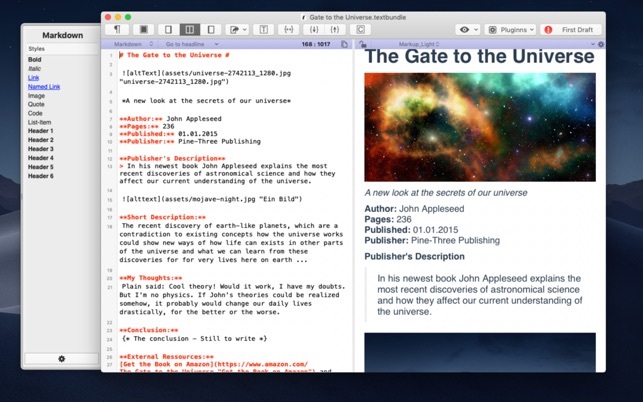 MarkMyWords is a comprehensive writing environment for everyone who creates articles with markup-formatting. - a flexible "distraction-free mode"
MarkMyWords DOES NOT use databases or proprietary file formats for saving documents. All documents created with MarkMyWords are saved as plain text files by default and are therefore Application- and Platform-Independent. So you have full control over your texts. 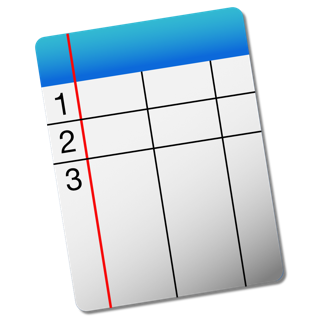 MarkMyWords also offers an option to store documents in the open Textbundle-format. 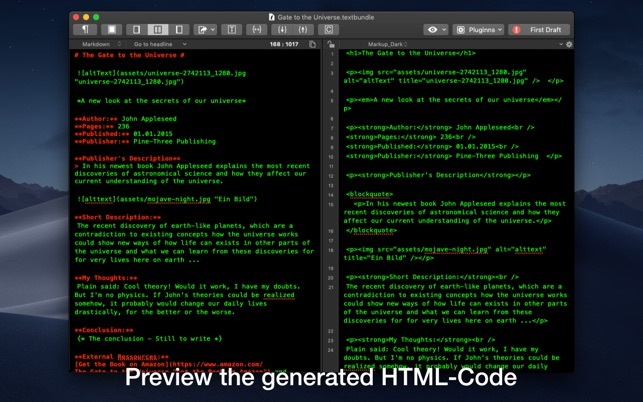 The text editor offers many useful features to simplify the writing of texts. In addition to the automatic closing of brackets and quotes, the editor also provides an automatic list generation. Moreover, an automated table creation is available for MultiMarkdown and Markdown Extra. 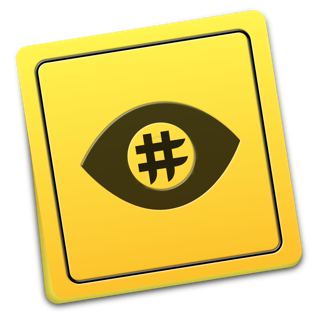 In addition, a rich set of keyboard shortcuts for the most common formatting and actions for moving/copying text within documents is available. MarkMyWords also provides many options to offer a comfortable working environment by setting many aspects of the editor to your personal preferences. Next to settings for font-color, -style and -size, there are also options for spacing of lines, paragraphs, etc. and the option to display line numbering next to the editor. The live preview shows your texts in the formatted state. When displaying you can either use on of the inbuilt CSS-Styles or use your own CSS-Styles. It is also possible to display CriticMarkup formatting. By using templates MarkMyWords you can write articles with repetitive text structures even faster. You can create templates yourself and insert them at any time into a document. In conjunction with the other functions of MarkMyWords you can create texts faster and more focused. The feature-set of MarkMyWords can be extended by its own plugin system. By using the widely used scripting languages ​​Perl, PHP, Python or Ruby, individual plugins are developed with ease that meet the individual requirements. The distraction-free mode hides all elements and thus directs the full concentration to the actual text. 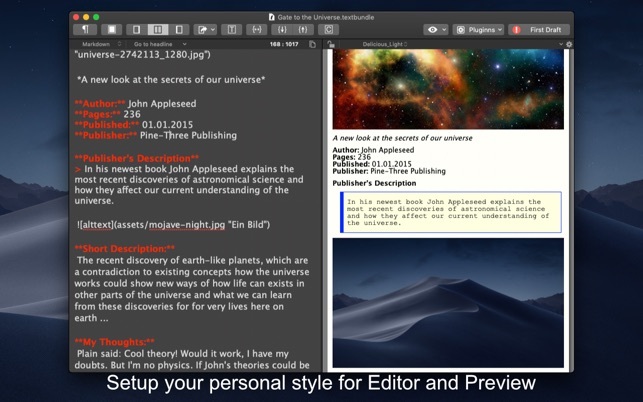 Just alike for the normal editor, extensive options are available for the distraction free mode to customize the environment to your preferences. For more information about MarkMyWords, visit Xelaton.com. There you can also send me a message in case of problems or questions via the contact form! I’ve been meaning to write this for sometime. The app itself is good, but somehow after installation all my markdown and .tex files end up with the MarkMyWords icon and with MarkMyWords as the default app to open the files. Not good. Even after changing it in the “Get Info” window for a file, the icon remains. If I open MMW, the app once again becomes the default app for these file types. I’ve reluctantly uninstalled the app as the only way to curb this intrusive behavior. For a filetype (such as like markdown or tex) that can be opened by many apps, I want to decide what the default app to open the file is. Disappointed that a developer would do this. I'm sorry to hear you have a bad feeling about MarkMyWords, but your assumption is wrong. MarkMyWords doesn't actively claim filetypes for itself, but this is a native macOS behavior. 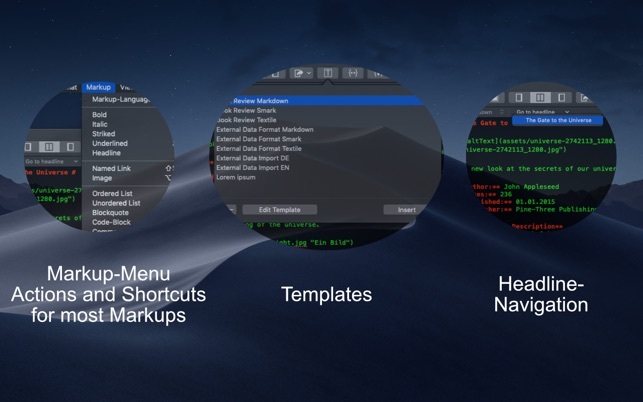 The thing MarkMyWords does is to explain macOS which types of file-extensions it can open and provides appropriate file-icons for the files it can open. If you change the default-application for a file-type and the icon doesn't change means the selected application doesn't provide a appropriate file-icon for the file-extension. 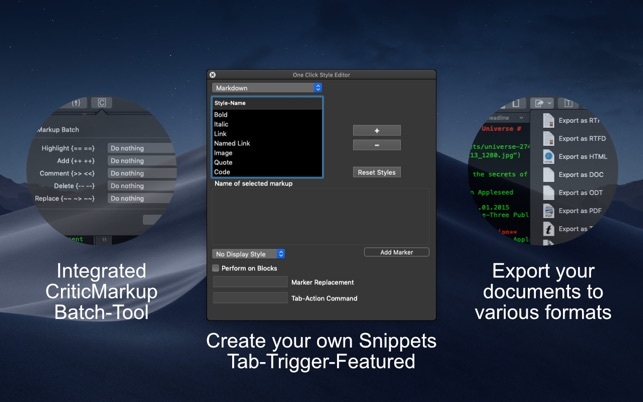 To make a change to the default-application to open a certain file-type you also need to click the "Change All.."-Button, which appears when choosing another application. If you have further questions, use the support-form on Xelaton.com please. Open standards. Open formats. Keep It Simple Sam. I have every one of this developers’ products and couldn’t be happier. I sync all my notes on my Synology DiskStation. I don’t use “the cloud”. Everything works flawlessly. Plus, I have the peace of mind knowing that all my data is in an easy to migrate format (markdown usually) and not housed in some proprietary database “locking me in” to a specific Company or software package. This is a decent tool that have some potential. The php textile parser is a little laggy at times. I would say the UI needs a LOT of work and the icon is horrific. Not to mention the name…just bad…sorry just being honest. It would not hurt the developer of this app to try out iA Writer to get some ideas. The features however get the job done. 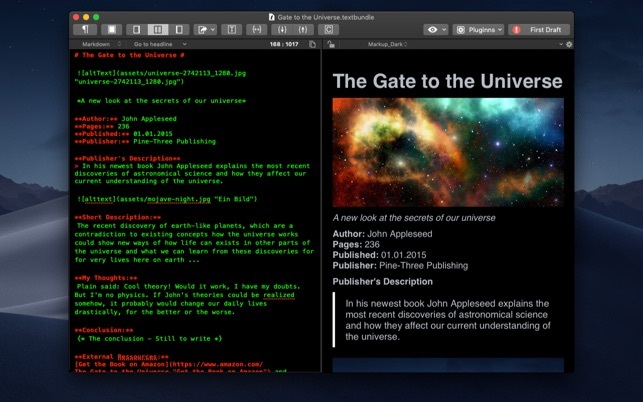 A good companion if you do a lot of work in basecamp with writeboads. This is the only tool I have found thus far for creating templates written using the textile syntax.